Next week Marvel launches its brand new “The Haunted Mansion” comic book series based on the world-famous Disneyland attraction of the same name, and we had the exciting opportunity to speak with writer Joshua Williamson about how he became involved with the project and which elements of his Haunted Mansion superfandom he’s incorporating into the comic itself. Inside the Magic: Can you give us a sense of your history in comics, and how you first broke into the industry? Joshua Williamson: I’ve been reading comics since I was a little kid. I don’t remember a time when I wasn’t reading comic books. And I started working at a [comic book] store when I was fifteen, and I just always knew that I wanted [this]. It was always my goal to work in comics. I didn’t really know how I was going to get there, or what I was going to do, but I knew I wanted to work in comics. And for a minute there I wanted to be an editor or an art director, I wanted to be on that side of things—still creative, but almost in a managerial position. So when I went to college, I was in that zone of working on anthologies with people and working with artists and writers. But I learned that I had the drive for writing more than anything else. And when I started talking to some publishers—and this is [when] I was still pretty young—they had this attitude [that] I needed to publish comics to prove that I could publish comics—like small press, self-publishing, which is how I think a lot of people get into comics. And so that’s what I had to do. So I started just writing comics. 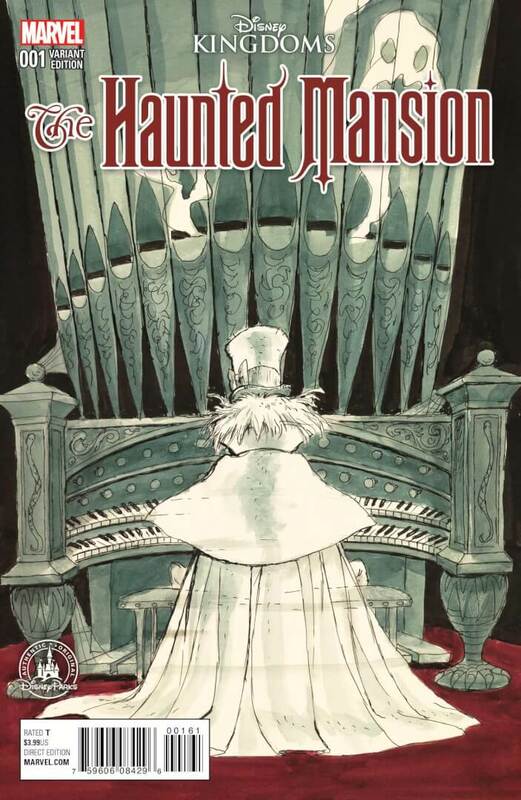 How did you get involved with the Haunted Mansion comic? “Haunted Mansion” was a dream come true. I had been trying to write a Haunted Mansion comic for years. I started talking to Disney first, actually. I went to them. I [had done] this kids’ book back in 2007 called “Dear Dracula,” which is about a little kid who writes to Dracula at Halloween instead of writing to Santa Claus at Christmas. And people really liked it, Cartoon Network made a cartoon of it—a little Halloween short, a made-for-TV movie. And so he had mentioned it to someone at Marvel, and they actually had already started talking about it, and they knew from Disney that I was already interested. And [there] was this flood of, “This guy would be perfect for this job.” And so at one point I was at New York Comic Con and somebody said to me, “If we ever got to do a Haunted Mansion comic, you would be great for it.” And I was like, “Yeah, that would be totally cool. I would love to do that.” I’m not even sure there was anyone else ever even considered. Do you know if the success of some of the recent Disney theme-park attraction-based comics like “Figment” or “Big Thunder Mountain” have an impact on getting Haunted Mansion off the ground? I imagine that had to be a part of it. I think that the Haunted Mansion [brand] is very protected. It’s one of the jewels of Disney. I feel like it is something, if you look at the history of the attraction, and you look at what they’ve done over the years with it, they haven’t really done much with it. There was the movie, and there was some other stuff in there, but they’ve really been protective of it. And that movie was ten years ago. So now you look at how, since the 45th anniversary [of the Disneyland Haunted Mansion] they’ve started releasing a lot more merchandise for it. And I think somebody finally realized—they knew there was a huge group of people who are fanatics about the Haunted Mansion. There’s no way they didn’t know that. But I think it was a mix of two things, and this is me totally guessing. After you came on board, what were your first thoughts about how to approach the actual story of the comic itself? And through Disney Imagineering magic, they were able to make this perfect mix of the two, that feels like it has a flow to it, [it] has a rhythm. It goes back and forth between the funny and the horror. That was important to me: finding that balance, trying to find a way of replicating what they did in the ride with that balance. It has that overall macabre, dark theme, but there is a humor/horror thing shifting back and forth. Trying to find ways of doing that in the comic was the most important thing to me. How much input did Marvel and Disney have on the story? Everybody’s been really supportive. It’s all been good ideas. They’ve liked some stuff, they thought some things didn’t work. I gave them a couple different ideas in the beginning and we just kind of picked the one that we thought worked best, and we started exploring that idea and how it was going to work, and what the story [was going to be]. Because of course there has to be a story. And it has to have some emotional beats to it; it can’t just be a tour of the mansion. Even though we definitely have a lot of that! How many elements of the existing mythology are built in to the comic? How many of the familiar faces are we going to see? We’re trying to get everything in there. I’m trying to find ways of getting everything, even if it’s just a shot of them. [For example,] Master Gracey isn’t really in the series that much, but we make sure that painting of him in the hallway is there. But I’m trying to get everything. What led to the decision to avoid Master Gracey as a main part of the story? Is that because the movie already covered that territory in-depth? Did you feel like it had been done already? It wasn’t so much that, as it was the story I wanted to tell didn’t really involve him. And I didn’t want to get too definitive on [the Master Gracey story]. That’s actually one of the things that [are] kind of touched on in the first issue. I didn’t want it too definitive on an exact history of the mansion. I think one of the best parts about the mansion is there is a mystique. There is no set storyline. There is no exact [history]—and I’m mostly dealing with the Anaheim one. There’s no specific, “This is the origin story of the mansion.” And I didn’t want to do that. And I think Gracey, particularly [in] the movie, really digs deep into the history. He gives you a story of what it is, and I wanted to tell a different story. But I’m trying to put as much as we can in there. Even the little gags, and the feel of things, and what mythology we know. [When you read the comic,] by the first two pages you’ll be like “Oh, I get what they’re doing,” [especially with] how much cool stuff we’re throwing in there. 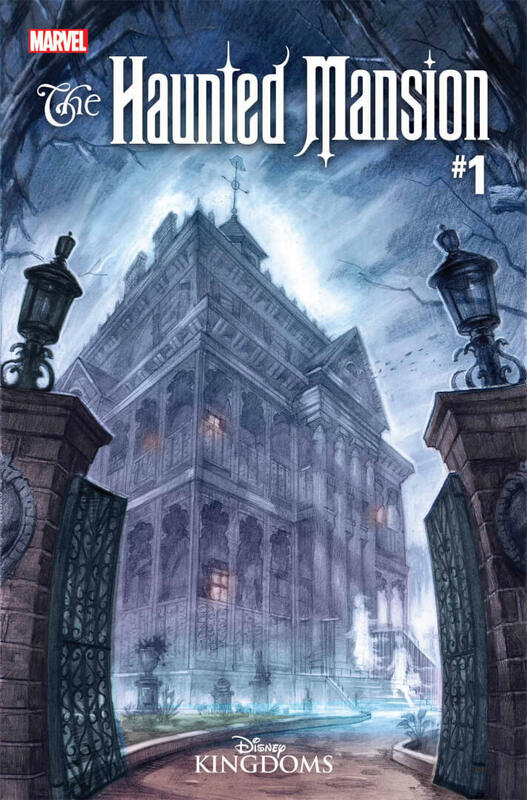 One thing that’s going to be kind of funny is, if you’re super familiar with the Haunted Mansion, when you read that first issue you’re going to feel like you’re going on the ride. “The Haunted Mansion” issue #1 hits comic book shops and Disney parks next Wednesday, March 9th.